Callahan Mine Superfund Site Community Update July 2018 - Environmental Quality Management, Inc. 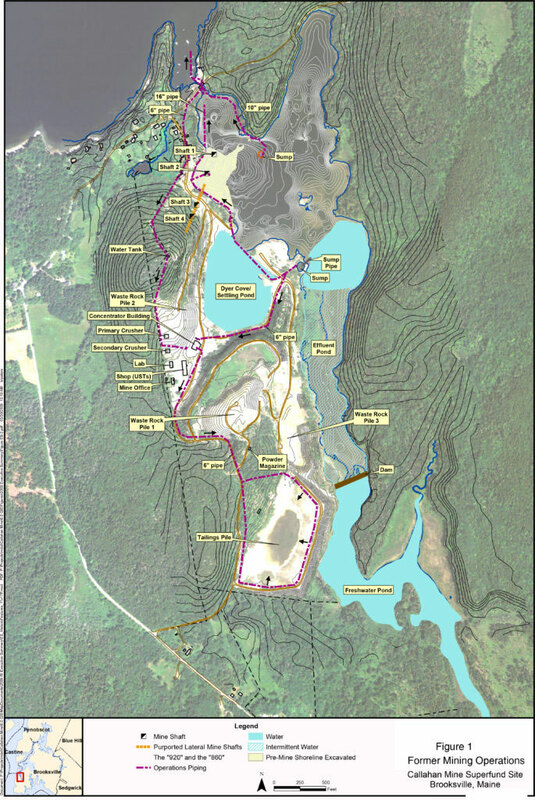 The United States Environmental Protection Agency (EPA) and Maine Department of Environmental Protection (MEDEP) continue their efforts to implement the cleanup of the Callahan Mine Superfund Site. The major accomplishment to date in 2018 has been the award of a contract for the performance of the cleanup work. The United States Army Corps of Engineers (USACE), working for EPA, awarded a contract to Environmental Quality Management, Inc. 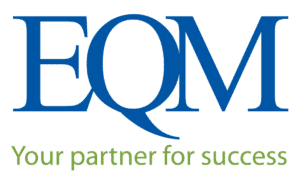 The EQM team has substantial expertise in mine closure design and remediation. The initial phase of the work includes activities to stabilize and grade the tailings impoundment in preparation for the installation of the cover system. Other activities that will be performed include periodic maintenance of the horizontal drain installed in 2015 to drain water from the tailing pile, flow measurements, water level measurements, and water quality sampling of the horizontal drain, bioreactor, and groundwater. Completion of the design for the sediment cleanup and site restoration. The Callahan Mine Superfund Site is located in the Town of Brooksville, Hancock County, Maine. The Site is the former location of a zinc/copper open-pit mine. The mining operations were conducted adjacent to and beneath Goose Pond, a tidal estuary. A 21-acre tailings impoundment containing the process waste from the floatation mill. The former processing facility (Mine Operations Area). The ore storage area (Ore Pad). Goose Pond estuary and associated wetlands. 600 feet wide and 320 feet deep at the end of the mining activities. The Site was listed on the National Priorities List (“NPL”) on September 5, 2002. EPA began the Remedial Investigation and Feasibility (“RI/FS”) for the Site in 2004, although some preliminary RI/FS activities began in 2003. In June 2005, the Maine Department of Transportation (“MaineDOT”) took over the RI/FS pursuant to an Administrative Order on Consent (“AOC”) between EPA and the State. 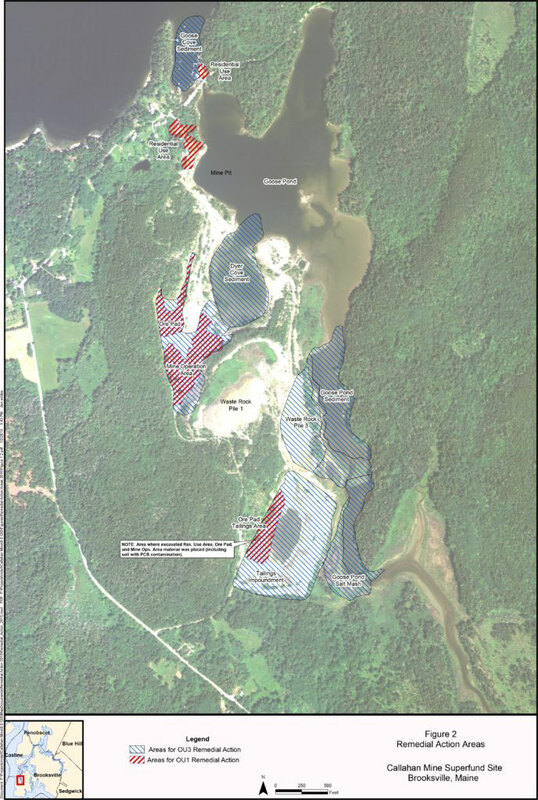 Based on the September 2009 EPA Record of Decision for Operable Unit 1 (“OU1”) and September 2013 Explanation of Significant Differences (“2013 ESD”), EPA is implementing the cleanup for the Callahan Mine in three distinct phases. Cleanup of the arsenic, lead, and thallium contamination in several residential properties along with the cleanup of the PCB contamination in the former Mine Operations Area. As part of the Phase 1 actions, the waste rock and remnant ore at the Ore Pad was removed and placed on the Tailings Impoundment. The Phase 1 (Operable Unit 1) cleanup actions were completed in 2013. Study of the groundwater contamination and waste rock outside the major waste areas. This component of the cleanup is still in the investigation phase. Stabilization of the Tailings Impoundment and removal of sediments and soils from the salt marsh and southern portion of Goose Pond and placement of the excavated sediments and soils into an on-site Confined Aquatic Disposal Cell (former Mine Open Pit). The Phase 3 cleanup is being implemented in two components. The first is the stabilization of the Tailings Impoundment. The design for this work was completed in 2015 and the cleanup began in 2015 with the installation of a horizontal drain to facilitate drainage of the Tailings Impoundment. The work to stabilize the Tailings Impoundment will continue through 2018. The design for the sediment cleanup is ongoing and should be complete in 2018. Figure 2 shows the areas that have been identified for cleanup actions. More information about the Callahan Mine Superfund Site can be found at the EPA website: www.epa.gov/superfund/callahan.